Sunday Night Football Extra: the future of sports television. You can catch a glimpse of it online with NBC’s Sunday Night Football Extra. In 1991, Sports Illustrated forecast that in the year 2000 (cue Conan O’Brien), any sports fan would be able to punch up any camera angle from any game at any time—in short, to be a couch-bound producer and director. While it’s not quite the Olympian vision SI prophesied, 21st-century fans can now approximate the inside of a production truck. During the baseball playoffs, MLB.com debuted “TBS Hot Corner,” a live video stream that shows four angles you won’t find on TV: “backstop cam,” pitcher cam,” “dugout cam,” and “batter cam.” NBC and NFL.com have also started supplementing NBC’s Sunday Night Football with four extra online-only camera angles that run alongside a stream of NBC’s actual telecast. As a sports-television producer, I was particularly interested in checking out these new streams. After tuning in to NFL.com for several games, I’m happy to report that the producer (and director) haven’t been consigned to the dustbin—these do-it-yourself productions still don’t come close to replicating the experience of watching a game on TV. These online streams aren’t really meant to compete with high-definition television, though, and shouldn’t be approached that way. Perhaps in the future (the year 2020? ), the home viewer will have total control over everything that comes into his living room. But for now, let’s be content to enhance our TV broadcasts with some extra online goodies—sour cream and bacon bits for the couch potato. An inventory of the camera angles: First is the high end-zone cam, which is essentially the same as the coaches’ film—formation junkies, this one’s for you. While you can’t see the receivers flanked wide or the corners who are covering them at the snap, the rest of the players are visible. If you want to know what the QB is seeing when he breaks the huddle—is the safety in the box? is a blitz coming? should I shift the play to the strong side to take advantage of the defensive personnel?—plan on spending some time with this angle. I viewed almost the entire first quarter of the first game I watched online (Steelers at Browns) from this vantage. The low-angle sideline cam is akin to standing on the bench during the game—great for watching sweeps in the direction of the camera and for judging whether the ball carrier broke the plane of the end zone. Otherwise, it’s like getting a sideline pass without getting to stand next to all the players. You miss most of the action, and you don’t get any free Gatorade. The “Star” cam isolates on one player from each team—or, in the case of the Tampa-Seattle game, five different players. Other “stars” have included Pittsburgh wide receiver Hines Ward and safety Troy Polamalu, Jacksonville QB David Gerrard, and Cleveland wideout Braylon Edwards. For quarterbacks, this feature is a bit redundant—the camera’s always on the guy with the ball—but it’s fantastic for the other positions. Watching Polamalu fly around the field at full speed on every play is fantastic, and not just because his jouncing hair is hypnotic. Few athletes play with Polamalu’s reckless abandon, and it’s thrilling to try to forecast collisions by watching him bounce around the iso cam. The Star cam works even better for receivers. After watching Ward and Edwards for three straight hours, I now understand why so many wide receivers are narcissistic—their job is to run one wind sprint after another with only the occasional ball thrown their way to break up the track workout. Even Ward, by consensus the most team-first, blocking-happy wideout in the league (although we cognoscenti also know him as a dirty player), could be seen remonstrating angrily that he was open, breaking off routes halfheartedly, and, when teammate Nate Washington scored on a pass play against the Jaguars, cutting directly to the bench rather than joining his buddy for a little celebration. Mostly, he just ran, ran, ran. Ward also looked up at the JumboTron regularly, hoping to determine what had happened on pass plays not directed at him. That’s another revelation (or perhaps confirmation) provided by the extra angles—generally speaking, only the quarterback and the person who gets the ball know what happens on any given play. When the players all mumble about “having to check the film” to decipher why a play worked or didn’t, it’s not just dissembling—they likely don’t have a clue. The best angle of all is the cable cam, a bird’s eye view from a camera that’s suspended on a wire 20 or so feet above the field. You know the one—it’s the low-flying gizmo that’s punched up for a handful of plays on big-budget telecasts like SNF. After watching it live for a full quarter, it’s clear that the networks are cheating us. I want more cable cam on TV right now! The cam-on-a-wire provides a thrilling combo of video game hyperactivity and crunching impact. While the regular live-action angle captures much of football’s blend of speed and violence, this look enhances it like an electron microscope and exposes much of the mauling going on in the trenches to boot. Watching the cable cam as rain splatters the lens is like being on the field with a dripping face shield. (I can’t wait for online coverage of games played in wintry conditions.) When Browns running back Jerome Harrison took a screen pass and juked his way to a long gainer, I almost had to take some oxygen. In the Bucs-Seahawks contest, Leroy Hill of Seattle knocked out an opponent and a teammate on the same hit. From just above the action, the blow was so jolting and violent I felt for a moment that Teddy Roosevelt should have outlawed the game when he had the chance. Sacks are also amazing on the cable cam. If you don’t appreciate Ben Roethlisberger’s toughness, watch him absorb a beating on cable cam. I was ready to petition the league to let the Steelers have an extra bye week—and I’m a Bengals fan! With all this supplementary material on the Web, I’m not about to complain that SI’s idyll hasn’t arrived just yet. OK, I’ll complain a little. My biggest beef with Sunday Night Football Extra is that the extra angles don’t come with replays. We all take instant replay for granted until we don’t have it. Watching the games on NFL.com, I realized that without replay it’s impossible to understand the inner workings of a game that is much too fast for the naked eye. Statistics and most other graphics, like the First and Ten yellow line, are also missing. (The score/time line is omnipresent on all the angles.) Fixating on the other angles without frequently toggling back to the main broadcast feed (or having the TV on along with the computer) is like being inside a tornado—you know there’s a major event going on, but things move too quickly to grasp the big picture. Watching the cable cam for 10 straight minutes is a huge rush, but it’s pure viscera. It won’t help you understand strategy, or why a play worked (or didn’t). A great addition would be to have an analyst dedicated to the other angles. My dream: Ron Jaworski calling the high-angle formation cam. The NFL says the online enhancement is a one-year experiment, with its continuation hinging on usage and positive feedback. (The league is very satisfied with it so far, according to the PR man I spoke with.) Of course, once there are enough viewers and potential ad dollars, the endless excess inherent in regular football broadcasts will migrate online. Sunday Night Football Extra doesn’t so much reveal what we’re missing in traditional TV productions as it emphasizes the best parts of it, minus the dancing robots, endlessly repeated promos during play, and cutaways to the players’ mothers in the stands. Twenty years from now, when computers and TVs are replaced by an omnivorous media- consumption device, those elements will still be firmly in place, even though by that point, we’ll be able to project our own holographic images onto the field and, through advanced Wii-like technology, tear our knee ligaments just like Tom Brady—the ultimate fantasy football. 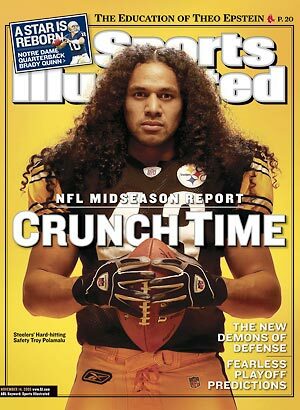 As much as I look forward to dodging the next-generation Troy Polamalu, I’m fully aware that the experience will involve beer ads and reminders that 60 Minutes is up next, except on the West Coast, where it can be seen at its regularly scheduled time.